AminCat DMCHA catalyst (N,N-Dimethylcyclohexylamine) is a strongly basic, clear, colorless-to-straw liquid tertiary amine. The material has a characteristic amine odor. AminCat DMCHA catalyst will darken on standing, with no effect on reactivity. Europe and United States: Provided AminCat DMCHA is on stock in our local warehouses our lead time is about one week if delivered in 170 KG steel drums. AminCat DMCHA catalyst is recommended for evaluation in a broad range of rigid foams. A major application is insulation foams, including spray, slabstock, board laminate and refrigeration formulations. AminCat DMCHA catalyst is also used in rigid foam furniture frame and decorative parts manufacturing. It can be used alone without any tin catalyst, or used together with other AminCat catalysts depending on process and specific requirements. 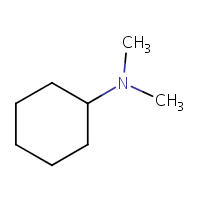 Store N,N-Dimethylcyclohexylamine in a cool, dry and well-ventilated area and in line with legal requirements. Keep AminCat DMCHA away from heat sources and oxidizing agents. A Material Safety Data Sheets (MSDS) is available for AminCat DMCHA and all other products supplied by Vesta Intracon BV. This substance (CAS: 98-94-2) has been pre-registered under REACH (EC) 1907/2006. N,N-Dimethylcyclohexylamine: Disclaimer. This information is supplied solely for informational purposes and Vesta Intracon bv makes no guarantees or warranties, either expressed or implied, with respect to the accuracy and use of this data. All product warranties and guarantees shall be governed by the Standard Terms of Sale. Nothing in this document is legal advice or is a substitute for competent legal advice.